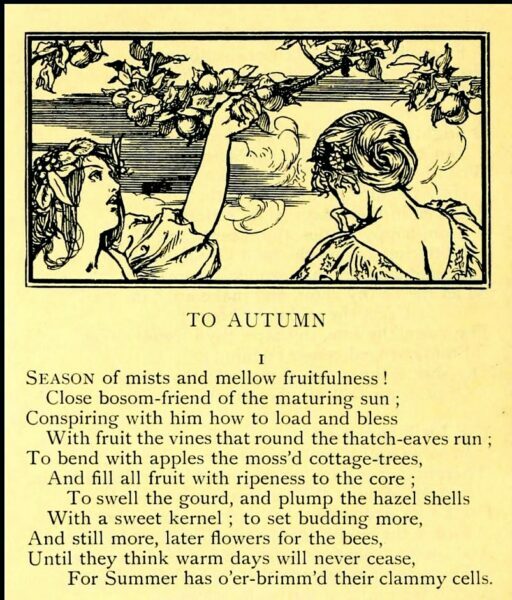 From the exceedingly good cakes of Mr Kipling in nineteen-seventies TV commercials, to supermarket adverts in more recent times, and most often without even a passing nod to Keats, copywriters have borrowed heavily from what many consider to be the poet’s last great ode – ‘To Autumn’. It is this specific Sunday’s view of a last–summers–day’s–beginning–of–autumn–day’s transition, season to season, and at once this vision of eternal autumn, its mists, its fullness, its gatherings, its drowsiness, and its warmth that sets it apart. It is the full cup emptied, filled then unfilled. The tone, therefore, is residually spiritual, elevated beyond the autumnal emotion. This discussion will endeavour to set out how the poem came into almost full being in just a few days in September 1819. It will also explore the change of poetical style from the Miltonic (John Milton – Paradise Lost) to the purest English, greatly influenced, in my view, by Thomas Chatterton (1752-1770). Chatterton was a prodigious talent from a very young age writing his first meaningful poems at eleven. However, despite this, he was considered by many to be a literary forger/impostor-poet. Most famously, the creation of a medieval identity for himself in the name of a fifteen-century priest/poet called Thomas Rowley. He even invented Rowley’s medieval language. Nonetheless, he was a creative genius publishing poems, sketches, essays, songs…before his young life was cut short aged seventeen after a drug overdose – some say accidental, others not. At the time of his premature death he had published fifty-three pieces and secured a book contract. Keats had been in Winchester since mid August, save for a trip up to London on 10th to 15th September, writing to finish off a number of his works which would later be included in Lamia, Isabella, The Eve of St Agnes and Other Poems published in June 1820 by Taylor and Hessey. Good progress had been made, with the exception of the troublesome Hyperion, which he had commenced in the autumn of the preceding year. He writes to Benjamin Bailey on 14th August confirming that he has been “…writing parts of my Hyperion…” however five weeks later, he tells John Hamilton Reynolds that he has given up with writing Hyperion, citing that it had too many Miltonic inversions in it, and he wanted to give his self up to other sensations. In this same letter to Reynolds he also mentions that he always somehow associated Thomas Chatterton with autumn. 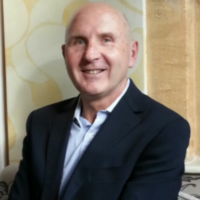 “He is the purest writer in the English language. He has no French idiom, or particles like Chaucer – ‘tis genuine English idiom in English words”. Keats later in the same week again revisits Chatterton in a long journal letter to his brother George and wife Georgina, written over the period Friday 17th to Monday 27th September. 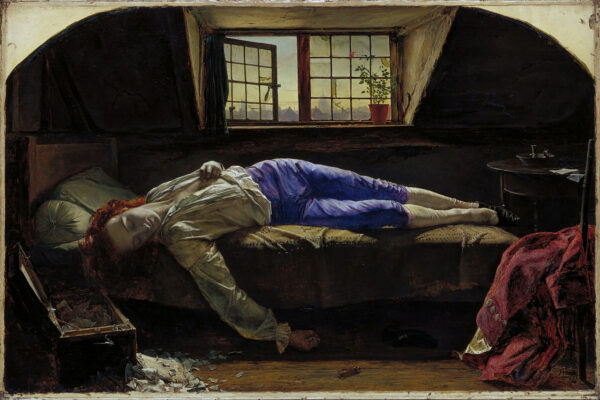 The journal entry for Saturday 18th September he reverts to the subject of Thomas Chatterton – it must have been in the forefront of his mind – “The purest English I think – or what ought to be the purest – is Chatterton’s”. He also advises that as part of his daily routine he takes a walk everyday for “an hour before dinner”; he goes on to share some detail about the first mile of his walk; passing the cathedral, through the college-like squares, onwards to College Street, crossing some meadows…You can virtually imagine him on the later part of his walk, standing on the chalk hills of the Twyford Downs, looking down towards the stubble-fields, and the visual warmth that they exude. In almost exactly one year to the day, John Keats would be embarking of the last chapter of his life, onboard the Maria Crowther bound for Italy. In a little more than 500 days he would be dead. 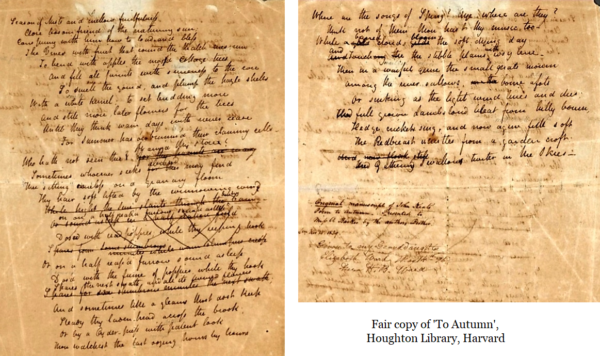 George Keats ended up with the only surviving fair copy of ‘To Autumn’ and in 1839 he gave it to a Miss Barker (late Mrs Ward) of Louisville, Kentucky. She gave it to her grand-daughter in 1896 who bequeathed it to the poet, Keats biographer and avid collector Amy Lowell, and henceforth to the Houghton Library at Harvard where it remains. Written on two pages, it is said that due to age, rather appropriately, the paper has taken on an oak-brown autumnal hue. Groom, Nick. 2004″Chatterton, Thomas (1752–1770), poet.” Oxford Dictionary of National Biography . Gittings, Robert. “Keats and Chatterton” Keats-Shelley Journal 4 (1955): 47-54.